One if by land and two if by sea – so goes the legend, but at Palm Beach Garden’s Waterway Café, customers can come by land and by sea. Abundant space is available for vehicles and boats. The elegant waterside ambiance has been a draw for three decades. During the day, the interior dining space is awash with natural light. Its superb location provides spectacular views of the water no matter where you sit. Beyond the main structure, a floating bar juts into the Intracoastal and, to the right, sits a series of tiki huts with clusters of colorful umbrella covered tables. Factor in the palm trees plus the sun and you get a sense of what paradise is like. It will get even better, according to Managing Partner, Richard Gagliardi, because plans are in the works for major renovations. Waterway menus are marked by a vibrancy and style that is immediately appealing. Eclectic and contemporary, the cuisine reflects many of the culinary trends that have gained a foothold in Palm Beach. 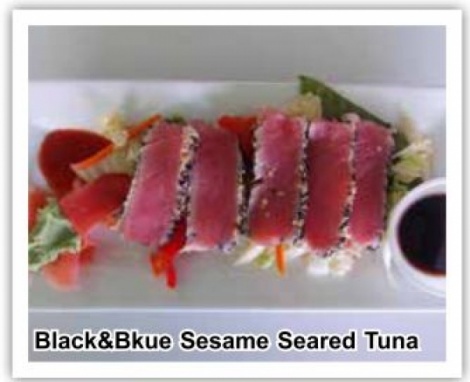 Black and Blue Sesame Seared Tuna ($12.95), for example, is a superb starter of pristine seafood artfully plated with Asian slaw accompanied with touches of wasabi, ginger plus a cup of ponzu sauce. Bringing the best of the bayou, the New Orleans BBQ Shrimp ($10.95) appetizer is a triumph of flavor and texture that arrives in a freshly baked bread bowl. Succulent shrimp, immersed in a to-die for sauce and fresh vegetables, are utterly delectable. Both of these starters were part of a trio that included the Spinach Salad ($13.95), a masterfully constructed medley of crisp veggies, toasted almonds, radiant strawberries over a heap of baby spinach topped with aromatic gorgonzola and zesty white balsamic vinaigrette. The inspired entrees are as scrumptious as they look. Grilled Grouper ($19.95) delivered a succulent filet enhanced with a subtle lemon butter sauce. Both mains are served with a choice of two sides. For a final treat, we opted for the crowd pleasing Apple Crisp topped with a scoop of vanilla ice cream. We owe the success of our gourmet experiences to the wonderfully adept staff. For more information log on to www.waterwaycafe. com.